Are You Considering Moving to Florida? Our Florida Relocation Guide contains cities and towns throughout Florida that are worthy of moving to. There are many reasons people are moving to new homes in the 21st century. For whatever reason you are considering, take a look at our guide and find out what makes Florida so popular. Florida covers 65,758 square miles and has a population of 21.64 million people. 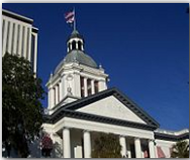 Florida’s capital is Tallahassee, which has a population of 191,049. Other important cities are Cape Coral (pop. 183,365), Clearwater (pop. 115,513), Coral Springs (pop. 13,037), Hialeah (pop. 239,673), Hollywood (pop. 153,627), Jacksonville (pop. 892,062), Miami (pop. 463,347), Orlando (pop. 280,257), Pembroke Pines (pop. 170,712), St. Petersburg (pop. 263,255) and Tampa (pop. 385,430). The Florida peninsula, warmed by surrounding subtropical and tropical waters and cooled by the trade winds, is famous for its pleasant climate, abundant sunshine, and scenery. The NW of Florida is a gently rolling panhandle area, cut into by deep swamps along the Gulf coast. The St. Marys River in the northeast and the Perdido River in the northwest form part of the boundary with Georgia, and Alabama. Much of the east coast is shielded from the Atlantic Ocean by narrow sandbars and barrier islands that protect the shallow lagoons, rivers, and bays. Immediately inland, pine and palmetto flatlands stretch from the Georgia border almost to the southern tip of the state. Central Florida abounds in lakes, with Lake Okeechobee being the largest. The Everglades, which includes Big Cypress Swamp, is a unique wilderness region of subtropical plant growth and animal life and extends over the center of the southern part of the peninsula. Florida’s SW coast, on the Gulf of Mexico, is dotted with tiny islands, and the Florida Keys, extending south and west from the southern tip of the state, are linked to the mainland by a causeway. Florida is separated from Cuba to the south by the Straits of Florida.